Is a lack of trust constraining your business? 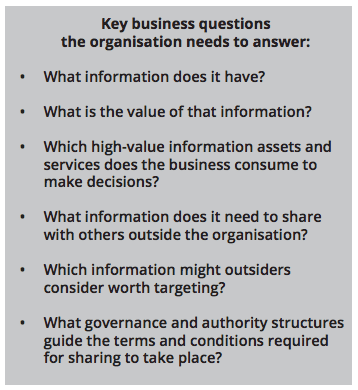 Organisations must share information, however, the risks involved in sharing are often seen to outweigh the benefits: sensitive information could be exposed, financial data stolen, a competitive advantage or even a reputation lost. As a result, organisations are often reluctant to share as openly as they would like, and they hope that their ICT systems can be trusted to keep their information assets safe. While information exists in many forms, organisations tend to expect ICT to enable information sharing while protecting it at the same time. These expectations are based on the assumption that secure information sharing is an ICT problem. It’s not. It is a business problem. Organisations simply make better decisions and respond more quickly to new threats and opportunities when information is reliable and available. The information sharing challenge Secure sharing implies and requires a level of trust. While digital information once flowed primarily within the perimeter of an organisation and information was only shared hand-to-hand between people who knew each other, today’s information is being shared at great speed, with people we do not know, and often with less thought as to the risks presented by these exchanges. To compound the fear of exposure, events such as Snowden and Wikileaks have shown that we cannot always trust our own people with the organisation’s most prized information. Fear of information exposure, arising from mistrust in people and in systems, constrains our preparedness to share. Without trust, we hesitate to share for fear of the consequences, which means the value and power of our information is diminished, and we may not be able to meet the strategic and operational objectives of our organisation. Therefore to do business, we must find a way to share information in an assured manner.